Dental insurance and discount dental plans. Individual and family plans. When looking for the best dental plan for your situation, consider these key differences between dental insurance and discount dental plans. You pay dentist at time of visit. Plan membership fee gives you discounted rates on most dental procedures from participating dental providers. You could save 10% to 60% on most dental procedures. No deductible. Discounted rates are available at time of visit. You and your family can use the discount dental plan as often as you need. You pay a monthly premium, deductible and co-pay/coinsurance. Insurance company pays dentist directly for remainder of charges. Can choose a PPO dental plan and use in-network providers, or an indemnity plan and see any dentist. Most dental insurance plans only cover up to a certain amount of dental expenses per person, per year. 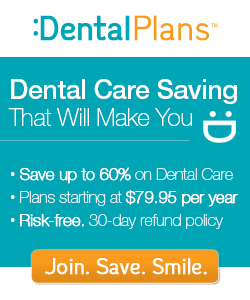 To compare discount dental plans, enter your ZIP Code above. For dental insurance quotes, click "Get Quotes" in the box to the right. To find low cost dental insurance or dental discount plans, take a few minutes to compare plans. Dental procedures can be expensive and without some help in covering costs, many people will skip getting important treatment. Dental insurance and discount dental plans are two different ways you can help cover the costs of dental procedures. Dental insurance plans are typically categorized as indemnity dental or managed care plans. Indemnity plans usually cover a wider choice of dental plan providers. Managed care plans provide coverage for dental providers within their network. Basically you get a broader choice of dentists with an indemnity plan, and lower out-of-pocket costs with a managed care plan. You can get individual dental insurance or a family dental plan. Like health insurance, you pay a premium to get certain benefits. Unlike medical insurance, however, benefits are typically limited. But it could still save you considerable money on x-rays, cleanings and regular checkups. You may also get coverage for dental implants, certain types of dental surgery and orthodontia. Discount dental plans are an alternative to dental insurance. They are for individuals, families and groups. Plan members pay participating dental providers a discounted fee for a wide range of dental procedures. Most plans offer discounts for examinations, cleanings, x-rays, fluoride treatments, plus you can get discounts on dental specialties on select plans. Start here to shop and compare dental insurance quotes and dental plan options available in your state. Compare up to 30 national and regional discount dental plans FREE by entering your ZIP code in the DentalPlans.com box above, or click here. Learn more about discount dental plans as an alternative to dental insurance, in our Article section. Take the time to compare dental insurance plans and discount dental plans to make sure you get the right one for your situation.